Honestly, I was concerned about installing a garbage disposer or doing any plumbing work, what-so-ever. I can safely say, this was the first time I had ever done this, but it was one of the easier installations I've experienced in the entire apartment so far. However, it was still not without its hiccups. Here's a visual journey of this process. 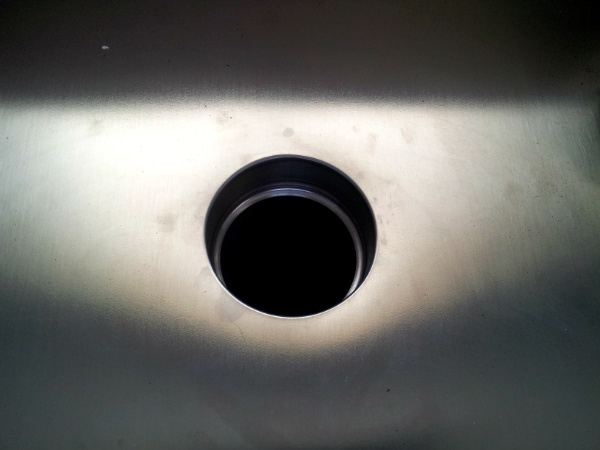 After my sink was undermounted to my new countertop, I took a few minutes to install the Elkay "Perfect Drain." 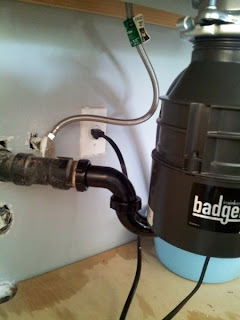 I had never seen a garbage disposer under a sink before, so I initially thought it would connect to the drain tailpiece and then plug in to the outlet my contractor wired for us. 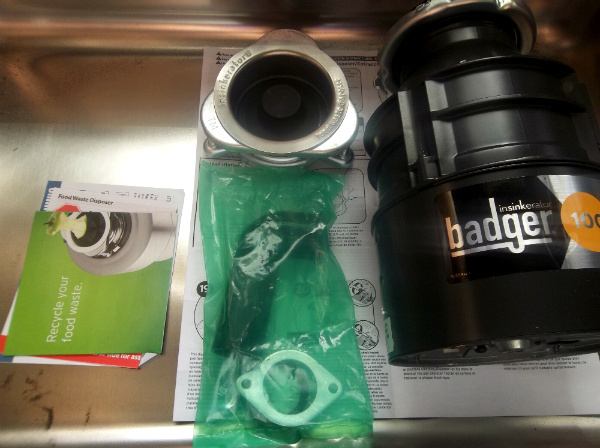 I purchased A Badger 100 with help from George in plumbing and unpacked the box. I removed the locking ring using a flat head screwdriver to release its firm tension around the indentation. Then I removed the sink flange for the first big installation step. 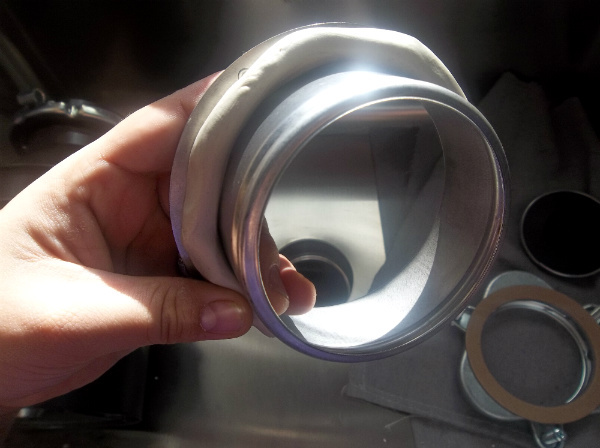 Following directions, I rolled a thick snake of plumber's putty and placed it around the sink flange that I detached from the Quick Lock mounting assembly. 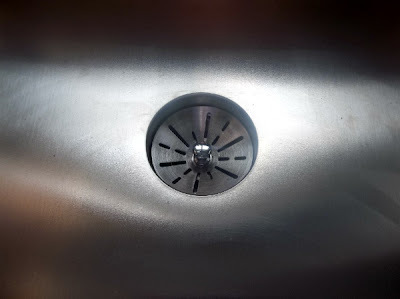 With full anticipation of even plumber's putty squeeze-out, the climactic moment was snuffed when I realized the sink flange did not fit in my sleek drain opening. I tried various angles, twisting, etc. Nothing in the directions explained this, either for the sink or the garbage disposal. 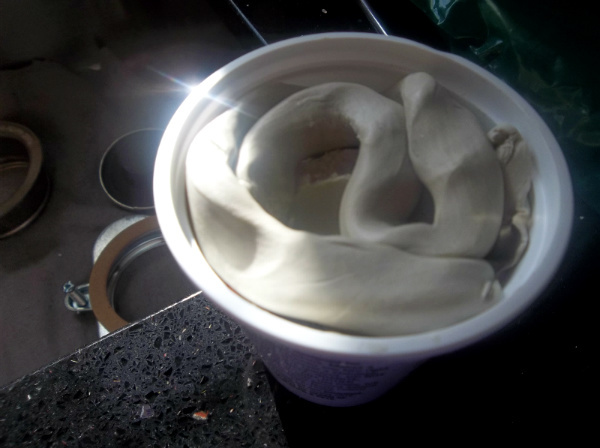 I removed the putty snake and repacked it in my new and now used container of plumber's putty. I traveled 35 minutes to return my disposal to the store from where I purchased it. I went to the customer service desk and received a cash refund for my disposer. 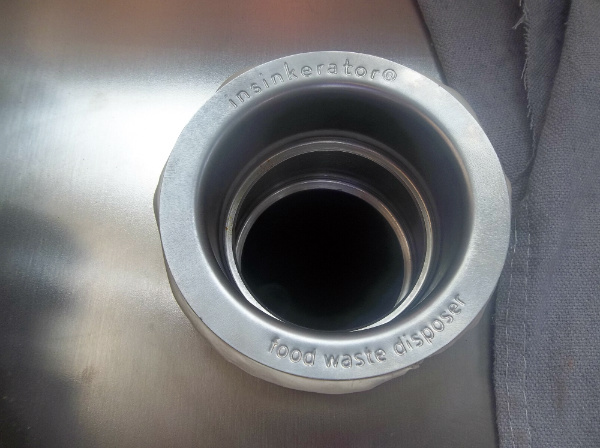 Then, a sales associate named John went to the disposer aisle to see if there was a narrower model for my sink. He found none. 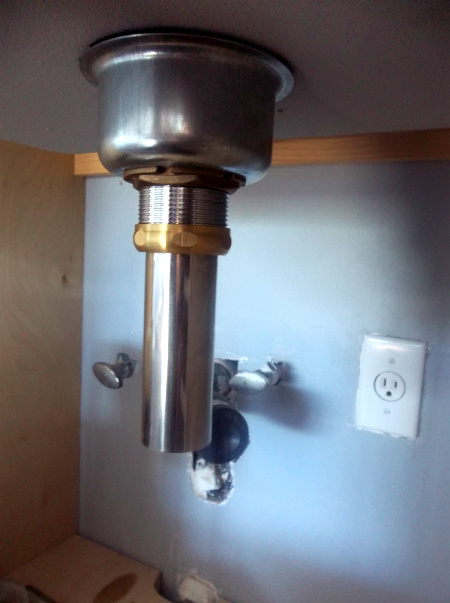 He was confused as to how the disposer could not fit and thought that I possibly trying to install it in a bar sink. I smiled and pointed to the Elkay sink model I purchased on display next to the disposers. 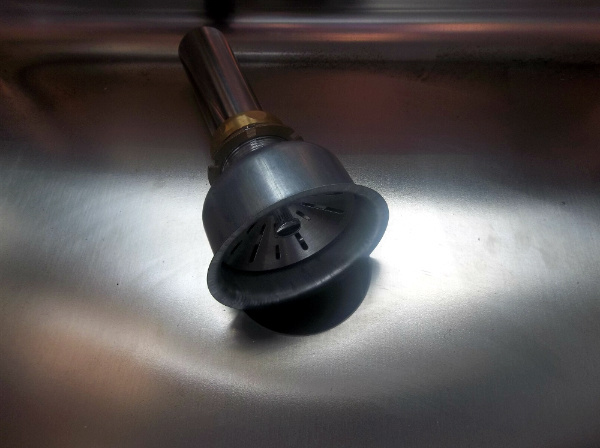 After about 15 minutes of trying to figure out why I couldn't use a standard disposer, John figured out that my Elkay sink didn't need the sink flange. One, there is no ring around the sink drain hole for it and 2, there is a flange and indentation for the ring already part of my drain hole so that I could mount the entire garbage disposal without the plumber's putty and sink flange to my sink itself. John, if you read this some day, you were a project-saver! I went back to the customer service desk and repurchased my disposer with the same cash. So I came home and peered down my again empty drain hole and remembered that this look would remain without a sink flange. Even though I couldn't have my "Perfect Drain" I could still have this clean-lined drain opening. It's the little things that tickle me, I swear. I mounted the Quick Lock assembly directly to my sink and clipped the ring in the indentation already provided. A perfect fit! 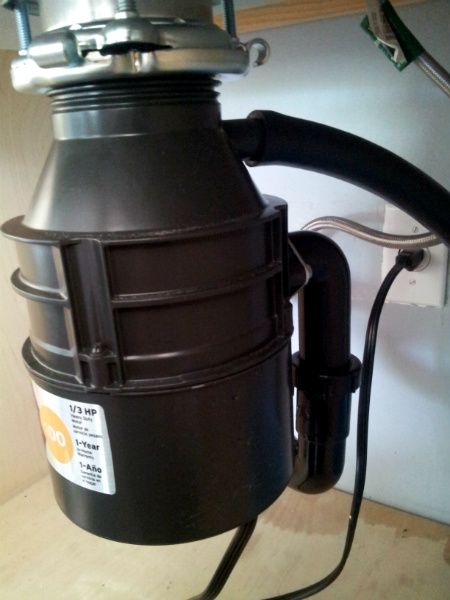 I then prepared to do the electrical hook up on the bottom of the disposer. 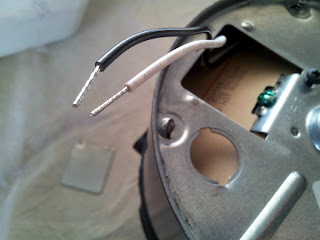 I loosened the black screw on the bottom of my Badger 100 and fished out my neutral and hot wires. I followed directions and left that cardboard insulation piece in. 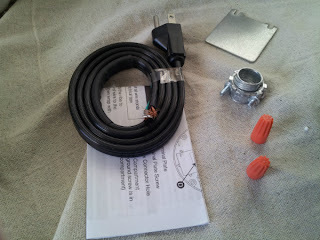 With help from George a few days earlier, I had purchased this power cord kit so that my garbage disposer could be plugged into the wall in the outlet my contractor made. The kit came with the power cord, instructions, 2 wire nuts, and a Romex connector. I placed the Romex connector in the hole beside the power supply cover. I fished the power cord with wire ends through the cable until I could pull it through the square power supply opening to join the black and white wires. 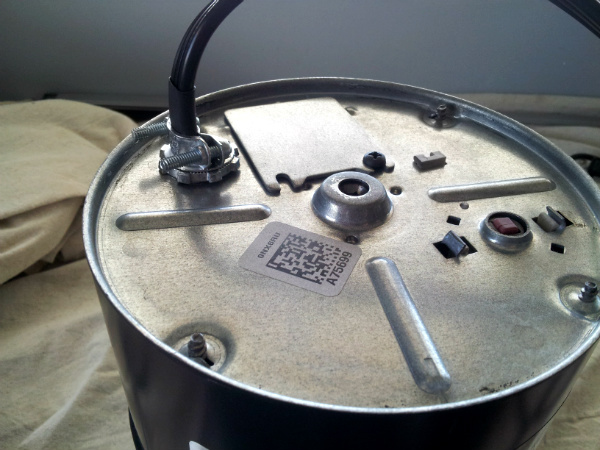 I tightened the screws on the Romex until a strong tug would not release the power cord from the Romex. I joined the ribbed wire with the white neutral disposer wire, twisted on the wire nut, and secured the connection with electrical tape. Then I repeated the process with the smooth power cord wire and black hot disposer wire. 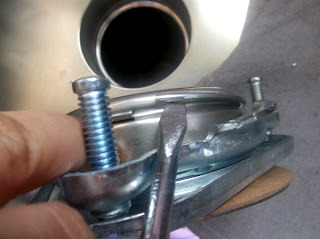 Then, I unscrewed the ground screw, placed the grounding hoop over the screw hole and rescrewed the ground screw until the grounding hoop was firmly in place. 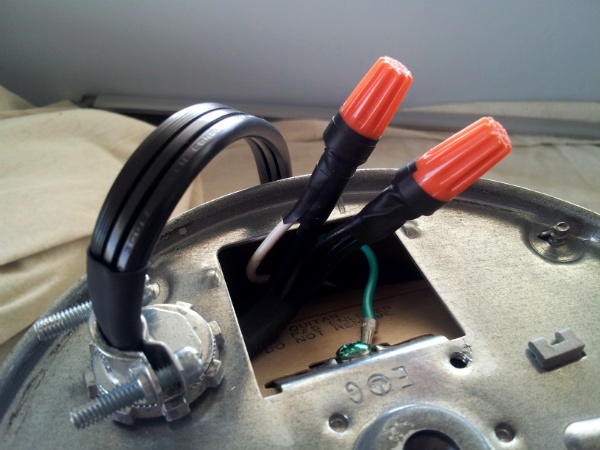 I carefully tucked all the wires down and screwed on the power supply cover. I popped out the dishwasher disposal plug with a blunt object and hammer (took me a few hits because I wasn't sure how much pressure to use), locked and twisted the disposer onto the mount and put a temporary dishwasher hose over the dishwasher disposal hole. I lead the hose to a small light blue basin to collect water until I could install our dishwasher. I then constructed my first P-trap, which was a lot easier than I thought it would be, just like this disposer installation. I connected the cold water 3/8" to 1/2" hose only, since I have to replace the hot water valve and can not until the Board of Water Supply can fix my supply line shut off valve. And we had water! I ran cold water for the first time in my new sink and new kitchen and tested the disposer. 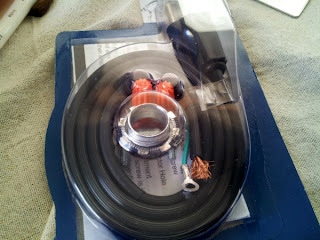 It hummed mechanically, but the DIY momentum made it sound peaceful and beautiful to my relieved ears. My contractor had placed a switch to the left of this image. 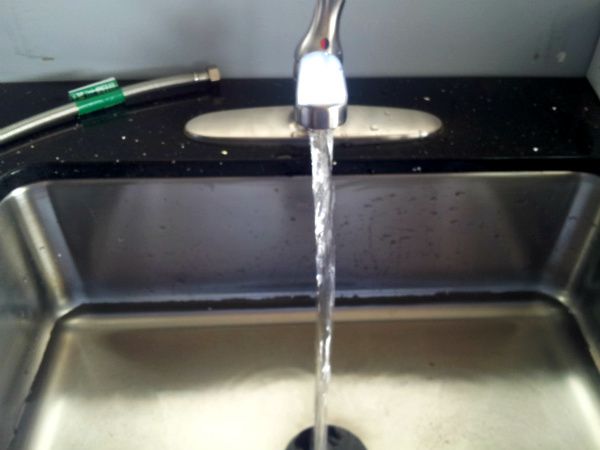 The hot water hose is pictures here, beside the faucet, awaiting the day it will be used. 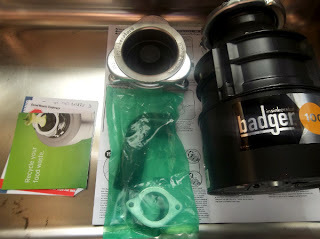 And that was the process I went through to install a garbage disposal. 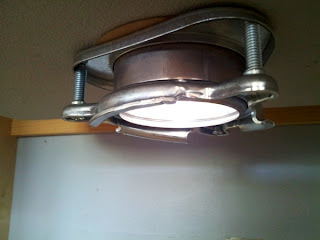 The installation itself was simple compared to say, the master bedroom ceiling fan, which I cracked my ceiling to install!